The interest in finite-time control has continuously grown in the last fifteen years. 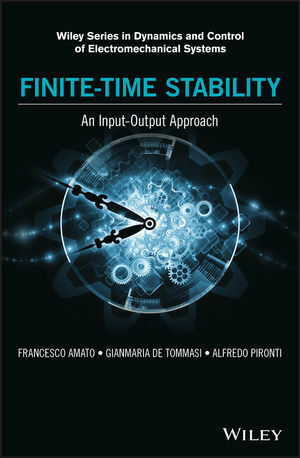 This book systematically presents the input-output finite-time stability (IO-FTS) analysis of dynamical systems, with specific reference to linear time-varying systems and hybrid systems. It discusses analysis, design and robustness issues, and includes applications to real world engineering problems. While classical FTS has an important theoretical significance, IO-FTS is a more practical concept, which is more suitable for real engineering applications, the goal of the research on this topic in the coming years. Includes applications to real world engineering problems. Input-output finite-time stability (IO-FTS) is a practical concept, useful to study the behavior of a dynamical system within a finite interval of time. Computationally tractable conditions are provided that render the technique applicable to time-invariant as well as time varying and impulsive (i.e. switching) systems. The LMIs formulation allows mixing the IO-FTS approach with existing control techniques (e. g. H∞ control, optimal control, pole placement, etc.). This book is essential reading for university researchers as well as post-graduate engineers practicing in the field of robust process control in research centers and industries. Topics dealt with in the book could also be taught at the level of advanced control courses for graduate students in the department of electrical and computer engineering, mechanical engineering, aeronautics and astronautics, and applied mathematics. FRANCESCO AMATO is Professor of Bioengineering, Dean of the School of Computer and Biomedical Engineering and the Coordinator of the Doctorate School in Biomedical and Computer Engineering at the University of Catanzaro, Italy. The scientific activity of Francesco Amato has developed in the fields of systems and control theory; robust control, finite-time stability and control, control of nonlinear quadratic systems with applications to the contexts of aircraft control, computational biology and bioengineering. He has published around 250 papers in international journals and conference proceedings and two monographs with Springer Verlag entitled "Robust Control of Linear Systems subject to Uncertain Time-Varying Parameters" and "Finite-Time Stability and Control". GIANMARIA DE TOMMASI is Associate Professor with the Department of Electrical Engineering and Information Technology, University of Naples Federico II, Italy. Since 2002, he has been a Visiting Researcher with the Joint European Torus (JET) Tokamak, Oxfordshire, U.K., where he has participated in various projects connected to the JET plasma current and shape control system. He has authored more than 100 journal and conference papers, and is a co-author of the monograph "Finite-Time Stability and Control" (Springer). His current research interests include control of nuclear fusion devices, fault detection for discrete event systems, identification of discrete event systems modeled with Petri nets, and stability on finite-time horizon of hybrid systems. Dr. De Tommasi is a member of the IEEE Control System Society Conference Editorial Board, and has been Guest Editor of the Fusion Engineering and Design special issue titled "Design and Implementation of Real-Time Systems for Magnetic Confined Fusion Devices". ALFREDO PIRONTI is a Full Professor of System and Control Theory in the Department of Electrical and Information Technology Engineering, University of Naples Federico II, Italy. He spent several periods as visiting researcher at the Max Planck Institute for Plasma Physics in Garching (Germany), the Center for Control Engineering and Computation (University of California at Santa Barbara), the ITER Joint Work Site of Naka (Japan), and the EFDA-JET site of Culham (UK). His research interests include application of feedback control to nuclear fusion problems, robust control of uncertain systems, and differential games theory. In 2005 he was guest editor for the IEEE Control Systems Magazine journal, where he contributed to two special issues focused on the control of plasmas in tokamak machines. He is the author of more than 200 papers published in international journals, books, and conference proceedings.